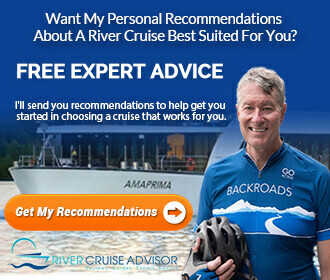 You are here: Home / Destinations / What’s the Best Choice For A Rhine River Cruise? River Ambassador on the Rhine River in Cologne, Germany. The Rhine River is one of the most traveled rivers in Europe. Cruises are available between Basel, Switzerland and Amsterdam, Netherlands and generally last about 8 days. You’ll also find packages that only travel along a portion of the Rhine and may last between 4 and 7 days. Cruises on the Rhine River are frequently combined with other waterways, such as the Moselle, Main and Danube rivers. A few itineraries also include the Dutch and Belgian Waterways, and the Saar and Neckar rivers. The Saar River is a tributary of the Moselle, and the Neckar is a tributary of the Rhine. What’s The Best Rhine River Cruise? If you have never taken a cruise on the Rhine, an itinerary between Amsterdam and Basel would probably be the best option. You would be able to experience the beauty of the Rhine River and visit many cities in France and Germany that are located along the river. For travelers who have already taken a cruise on the Rhine River, a package that includes the Moselle River will also provide a very picturesque journey with the many castles and vineyards that line the Moselle. A cruise that takes you from Amsterdam to Bucharest will allow you to travel along the upper Rhine River, the Main River through Germany and most of the Danube River. If you have at least 30 days to travel this would allow you to travel through several countries in Europe and to visit many incredible cities along the way. What’s the best Rhine River cruise for you? 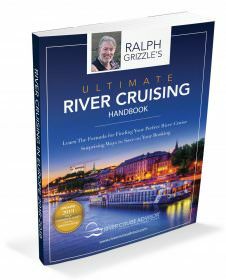 To find out read our complete roundup of Rhine river cruises. The Rhine River begins in the southeastern Swiss Alps in Switzerland. It extends for 760 miles from Switzerland to the Netherlands. The river initially flows from east to west and forms a border between Switzerland and two other countries – Austria and Liechtenstein. Once the Rhine River reaches Basel, it changes its course and begins to flow in a northerly direction between France and Germany. The Rhine River continues its course northward through Germany and the Netherlands until it empties in to the North Sea near Rotterdam. There are a few other waterways connected to the Rhine that are often featured in river cruise itineraries. The Rhine and Main rivers form a confluence at Mainz, Germany. In Koblenz the Moselle and Rhine Rivers meet. The Dutch and Belgian Waterways are also connected to the Rhine. And the Neckar River meets the Rhine at Mannheim, Germany. 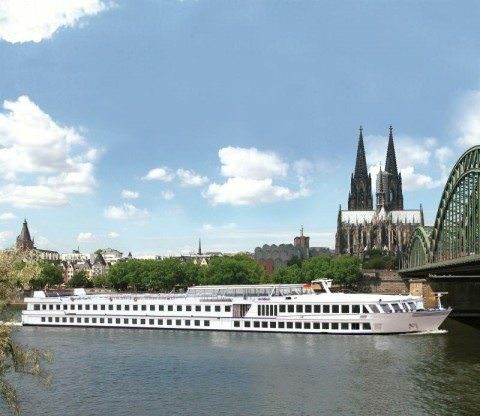 Read our full roundup of Best Rhine River Cruises. Worthless review. Does not answer the question of what’s the best Rhine River Cruise.